Are you wanting to start your gardening season earlier by growing vegetable transplants from seed? I’m going to give you some hacks to successfully direct sowing seeds indoors for transplanting vegetable seedlings later. You can do this any time of year, but winter is a very common time for starting seeds indoors. Winter is usually a cold, dreary season for many gardeners who are only looking forward to warmer weather. However, planning for and starting vegetables transplants from seed can make this a much more interesting time of year. Let’s jump right into the steps needed to be successful in seed starting. Transplanting vs direct seeding? Isn’t it just easier to take the seeds outside and stick them into the ground? Well, transplanting allows you to start those seeds earlier, grow them to plants and then plant those plants outside. It’s giving them a head start for success in the elements. You get to start gardening earlier in the season. Provide plants of cultivars not available commercially. Establish crops that are difficult to germinate under environmental conditions. Finally, you can grow transplants to sell to others in your areas. Kind of a backyard business idea, if you will. Here are 22 more backyard business ideas you can create from your hobbies and passions. But understand that not all crops benefit from transplants due to root damages and moving issues. Avoid growing root crops or legumes to move later. Those are better direct seeded and you can start most of them early anyways. Crops likely to benefit from transplanting include brassica head crops, lettuce, onions, celery, nightshades like tomato, etc. and cucurbits. But whether you start early or not, one thing is for sure. The quality of the seed you use means everything. Here are some tips for what to look for in a good seed. When deciding what seeds to plant, it’s a really good idea to use seeds that work for your area and your zone. 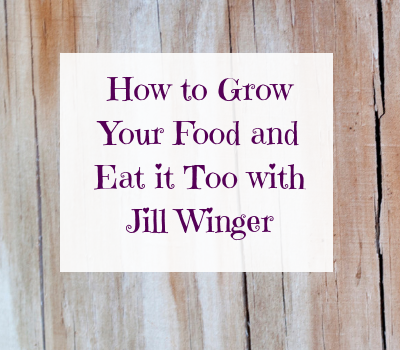 This is probably one of the most important tips for growing vegetable transplants. Good seed matters. In order to determine what works, it’s good talk to your neighbors, friends and local garden center about what has worked well for them. Then, obtain your seeds from a reputable source including garden centers and seed catalogs. If choosing seeds from a business that does not specialize in plants, pay special attention to the package date to make sure the seed was packaged for the current year. Though most seed remains viable for about 3 years, germination decreases as seed ages. Let’s talk more about using old seed. Since new seed can be expensive, you may want to consider using seed bought in previous years. Normally, seed will remain viable for about 3 years under cool, dark, dry, conditions though there are exceptions (carrot family). I keep seed packaged up in a tupperware container stored in my basement when not in use. Place 10 seeds on a warm wet paper towel and cover with a second warm wet towel. Roll up the towels and place inside a plastic bag with enough holes for air exchange but not so many that the towels dry quickly. Place the bag in a warm place such as the top of the fridge. Remoisten towels with warm water as needed. After the first week, check for germination. Remove sprouted seed and check again after another week. Finally, add the numbers together to determine the percent germination. Once you have a good idea of the amount of seeds that have germinated, you can determine whether it’s worth it to you to use it as transplant. Keep in mind, this process of determining whether old seed is good seed takes at least a week. Plan for that extra time before you plant your transplants. Timing is everything here. Let’s talk about how to determine that planting date for growing vegetable transplants from seed. Target date for transplanting outside. Number of weeks needed to grow the transplant. The target date highly depends on where you live. Click here to determine what hardiness zone you live in. I live in Northeast Kansas, which is Zone 6a. The target date for transplanting the cool-season crops such as broccoli, cabbage, cauliflower and onions are the end of March to the beginning of April. Warm-season crops like tomatoes, peppers and most annual flowers are usually planted about May 10. These are just examples. However, I believe there is NO magic date for planting anything. I prefer to plant by soil temperature because I live in Kansas where a late freeze in early May is just right around the corner. So, that is what I suggest: Have your planting date in mind to start your transplants but don’t transplant them outside until the soil temperature is right. You can always baby those plants a little bit longer inside. Now that you kind of know when you need to be starting your seeds, let’s talk about proper equipment and steps needed to do this thing. Bottom heat from a plant heating mat is useful for maintaining soil temperatures and is less expensive than maintaining higher air temperatures in the entire growing structure. Anything that helps me save money and helps my transplants grow is golden in my book! The one I’m sharing with you is water proof and maintains temperature just 10-20 degrees above normal air temperature. There are essentially three options when choosing the right container for your transplants. With options B & C, reusable containers need to be washed and sanitized with a 10 percent bleach solution prior to reusing to eliminate any contamination. Advantage: Transplant can be planted pot and all into the direct planting hole. This allows the pot to degrade in the soil, adding organic matter to the growing environment. Caution: If for some reason you have to hold the baby plants indoors longer, these containers will start to break down and stop holding water. Purchase the best Peat Containers for growing transplants here. Advantages of these containers include long life, ability to be “floated” and sub-irrigated in a fertilized water solution and reduction in soil temperature changes due to the insulating value of styrofoam. I have simply used styrofoam coffee cups to start seeds in and they work awesome. A cheap way to start transplants. 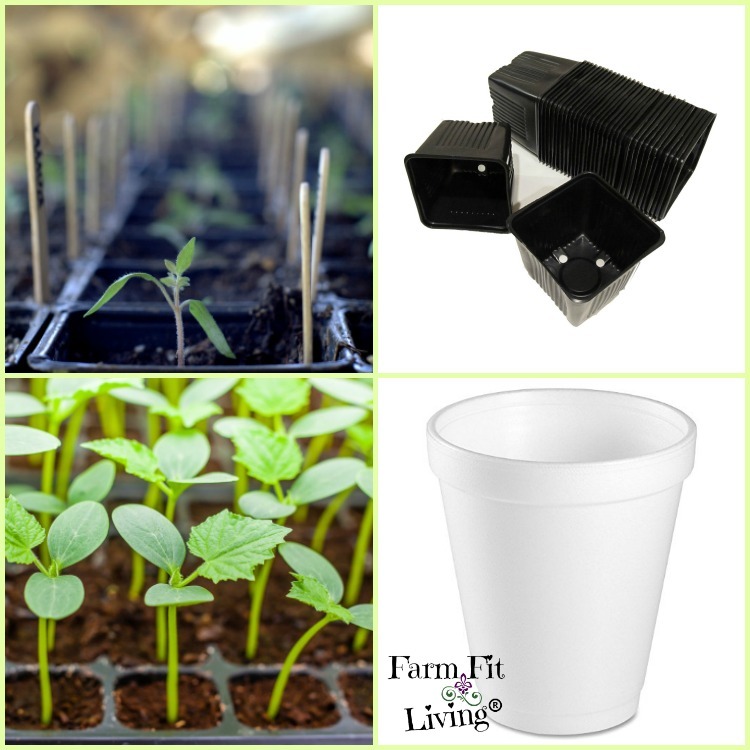 Shop Styrofoam containers for growing transplants here. Plastic can be formed into multi-celled container sheets making handling much more efficient. One advantage of plastic is that printed sticky labels will adhere to plastic containers, which allows for labeling of each container. Ok – Now we are ready to plant our seeds into our containers with potting soil. Do not use garden soil to germinate seed as it is too heavy and may contain disease organisms. Use a potting soil made especially for seed germination. This is a good one that I use. Now that the seed is in the ground, let’s talk moisture. Seed must be kept moist in order to germinate. But most transplants receive way too much. The rule of thumb is to only water often enough that the potting soil never dries. Using a clear plastic wrap over the top of the container can reduce the amount of watering needed. Remove the wrap after the seedlings emerge. Let’s talk lighting. Most plants will germinate in either darkness or light but some require darkness and others require light. All plants require adequate amounts of light once emergence occurs. South facing windows may not provide adequate amounts and so fluorescent fixtures are often used. Suspend the lights 2 to 4 inches above the top of the plants and leave the lights on for 16 hours each day. What options do you have for lighting? What does it all mean? Well, the number after the “T” refers to the diameter of the lamp in eighths of an inch. Therefore, a T-12 lamp is 12/8 or 1.5 inches in diameter and are what most people are familiar with. A T-8 is 8/8 or 1 inch in diameter, and a T-5 is 5/8 of an inch in diameter. So, does a smaller diameter mean less light? Not at all. In fact, the T-5 can be the brightest of the three. Another advantage for these newer lamps is they use less electricity per lumen. The traditional 48-inch T-12 is rated at 40 watts. However, there are newer styles of T-12’s that are 34 watts. The T-8 is rated at 32 watts and the T-5 at 28 watts. This sounds too good to be true. Are there drawbacks? Probably cost is the biggest one. Note that lamp costs are comparable between T-12’s and T-8’s. The T-5 lamps may be more expensive so check prices before converting. last longer and provide more light. Prices for T-5’s have been dropping so you may want to consider them as well. If you need a brand new grow light, this one uses T-5 and is well rated. rapidly. More and more growers are starting to use LED’s as supplemental lighting. Get your LED light to try out at home here. Now that we have lighting figured out, let’s talk about temperature. The temperature best for germination is often higher than what we may find in our homes especially since evaporating moisture can cool the germination media. Moving the container closer to the ceiling (top of a refrigerator) can help but a heating mat is best for consistent germination. After plants have germinated, they can be grown at a cooler temperature (65 to 70 degrees during the day and 55 to 60 degrees at night). This will help prevent tall, spindly transplants. This part might just be the most fun part of growing vegetable transplants from seed. Plants react to movement. Playing with your plants actually stimulate growth! Believe it or not, brushing over the plants with your hand stimulates them to become stockier and less leggy. Try 20 brushing strokes per day. Disclaimer about plant brushing: Brushing will not compensate for lack of light or over-crowding. Plants grown under inadequate light will be spindly regardless of any other treatment. 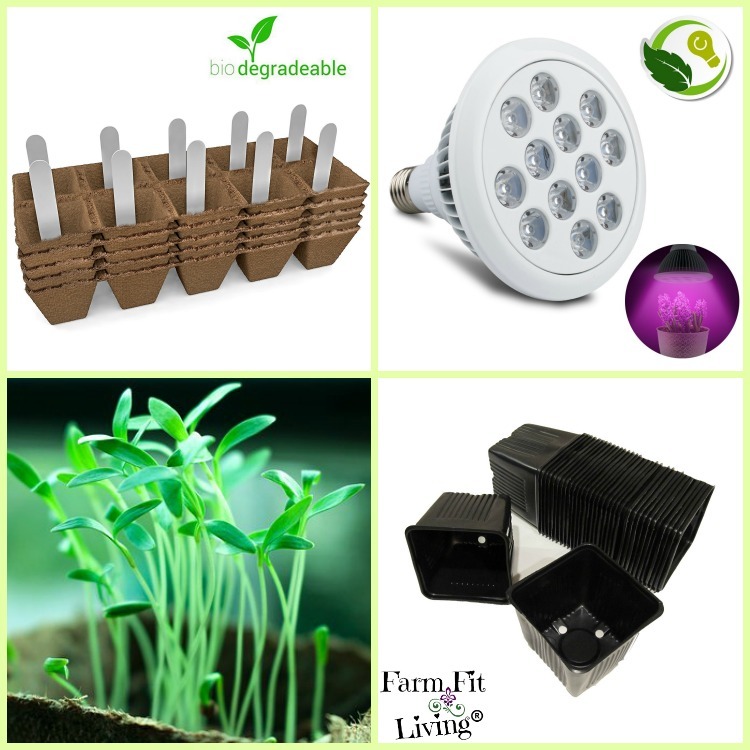 So, do refer back to lighting and be sure your seedlings have what they need to grow. Finally, your transplants are at the end of their journey indoors. They’re about ready to go out into the big world. And it’s time to let them go. But first, you’ll want to get to introduce them slowly to the outdoor environment. Kind of like you’re still holding their hand while they experience something new but then bring them back into the world they know. Gradually, you give them more time into that new world until they adapt to it. This is a process called hardening. Plants grown inside will often undergo transplant shock if not hardened off. Plants are hardened off by moving them outside and exposing them to sun and wind before transplanting occurs. Start about two weeks before transplanting and gradually expose the plants to outside conditions. Increase the number of hours and degree of exposure over the two-week period. Transplants that are hardened are more likely to be healthier and happier through the growing season. You’ll find that your plants are less stressed, which in turn are less susceptible to diseases. Healthy plants equals lots of healthy yields. That, my friend, is the end goal. Growing vegetable transplants from seed is a great way to start the gardening season early and to grow your own plants. With the best practices in place, you’ll be well on your way to growing healthy, hardy and well adapted baby plants to plant into your garden. I also included links to certain products I use and recommend as well as which vegetable crops respond best to transplanting vs. direct seeding. I hope you found this article helpful. Feel free to leave a comment!